Yahoo! Store Automation - Manual Transaction Interface: Automatically Access Yahoo! Store Credit Card Virtual Terminal! 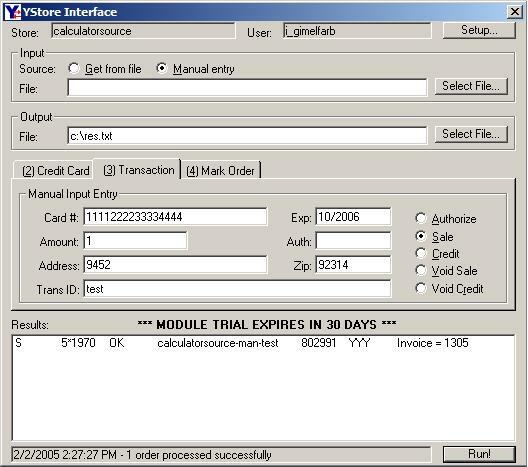 Manual Transaction Interface is a YStore Inteface module that gives you complete, secure, automated access to Manual Card Transaction functionality provided by Yahoo! Store. Manual Card Transaction is a full featured virtual terminal that gives you complete flexibility in credit card processing: authorize, charge, credit, and void transactions at any time, use your own transaction ids, charge and credit orders after the card number is removed from order pages, process payments for orders received through alternate sales channels or from your other businesses, and more! With this interface you can finally integrate this powerful functionality into your order processing system! Provides automated access to Card Number, Expiration Date, Amount, Transaction ID, Authorization Code, Address, and Zip fields on the Manual Card Transaction screen. Provides automated access to Authorize, Sale, Credit, Void Sale, and Void Credit functionality of the Manual Card Transaction screen. Allows processing credit cards beyond the 30 day limit imposed on the order pages. Allows processing credit cards not submitted through Yahoo! Store. Removes the need to pay for another gateway or merchant processor to effectively process payments. Allows you to fully integrate payment processing with your automation system, including your non-Yahoo! Store businesses. 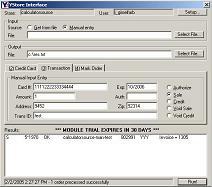 Allows your staff to process credit cards without gaining access to the Store Manager.